Grohe, a leading European manufacturer of sanitary fittings, including kitchen and bathroom faucets/taps, and shower systems, has launched its new Eurodisc Joy faucet line that combines operating comfort with award-winning design. This reinterpretation of a well-known classic faucet is an optimal combination of form and function – a dynamically curved, slanted silhouette, a filigree joystick with smooth action, a sleek edge running along the spout, according to a spokesperson for Grohe. 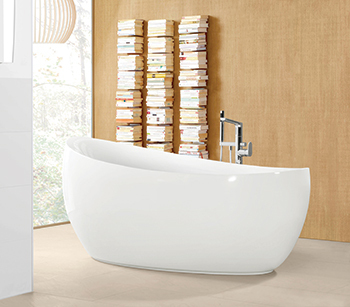 “The new line combines visual lightness with easy operation, bringing great looks and pure pleasure to the bathroom. The most important design feature of this faucet is its minimalist, infinitely adjustable joystick. Its superior ergonomics, combined with the innovative Grohe SilkMove cartridge technology, allows precise fingertip control of the water mix. At the same time, the integrated Grohe EcoJoy water-saving technology promotes responsible and sustainable consumption of water and energy,” he says. 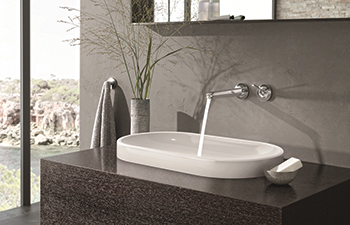 The wall-mounted washbasin faucets additionally feature the adjustable Grohe AquaGuide mousseur. Moreover, the SpeedClean technology ensures reliable functionality and a long life. The line comprises a full range of faucet variants for the entire bathroom. Grohe also offers on-the-wall shower and bathtub fittings sharing the unique joystick design for a fully coordinated bathroom decor. The faucet line is available in Grohe StarLight Chrome and the two-coloured Chrome/Moon White variant. Ideal Standard, a multinational bathroom, sanitary ware and plumbing fixture company headquartered in Belgium, is expanding its Connect range of bathrooms in a bid to meet the various personal needs and requirements of users. These include the Connect Freedom and Connect Rimless water closet (WC) solutions. Connect Freedom offers the ‘Freedom of Choice’, comprising a range of solutions for specific applications. It features innovation and practicality as well as enhanced comfort and well-being in the bathroom. It is specifically designed to meet all kinds of needs – especially those of the elderly and the disabled. The toilet models offer huge flexibility and options, such as raised toilet bowls, while remaining ergonomic, and also XL models with enlarged dimensions in projection, overall size and height that provide users with the opportunity to create the bathroom of their choice. The immaculate toilet bowl without flange ensures that there are no more concerns about ‘hidden areas’ that become the source of dirt and bacteria deposits in the WC and cannot be cleaned, or demand high effort and cleaning time, he says. The toilet has two flush ports in the rear and the water flows from the two large side openings, ensuring a powerful water stream for perfect rinsing. 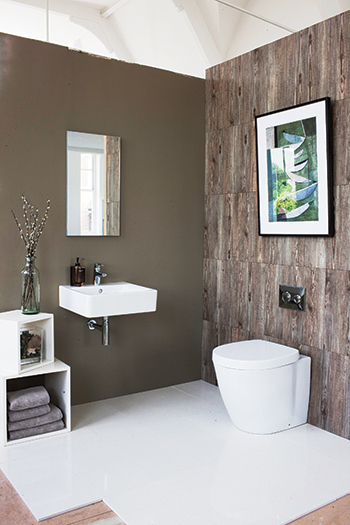 Connect offers total concepts or single pieces to complete the bathroom space. Villeroy & Boch’s (V&B) Aveo New Generation is a design inspired by nature and has been created to infuse warmth and a sense of calm through its modern contours, aesthetics and clarity, according to a spokesman for the Germany-headquartered ceramics manufacturer. The new product has been developed in line with V&B’s strategy to develop new innovative designs by focusing on sustainability, hygiene and comfort. “The high quality design is determined by clear oval forms to create the egg-shape bathtub, which is a symbol of the emergence of life,” explains the spokesman. Other new products introduced by the ceramics major are the Venticello and the Legato Furniture collections. With the Venticello collection, the company has combined straight lines with functionality and created a fresh approach to bathroom interior space. There is also a growing demand for easy-care materials and functions that are designed to clean themselves, such as the rimless DirectFlush WC equipped with the antibacterial glaze AntiBac and CeramicPlus for sustained cleanliness, he says. The Legato Furniture Collection offers superbly designed vanity units in a variety of colour variations.